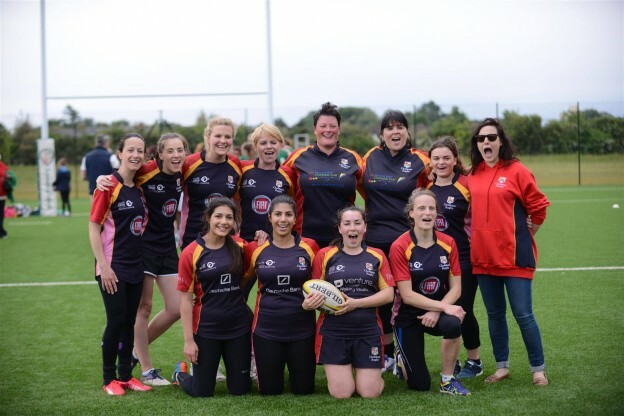 The benefit of 6 months of training was seen on Saturday as Chobham Ladies touch rugby team played their first match against London Irish ladies on the hi-tech artificial pitch. Winning the toss and attacking first with a solid set of six tackles taking the ball deep into Irish territory. With a strong defensive effort that was to be the standout feature of the match a turnover was won immediately to create a very early chance wide out but the pass didn’t quite go to hand. The opening minutes were played exclusively in the Irish half as the Chobham tactic of sending a ‘shooter’ to make the touch kept Irish back near their line, as Brooke, Zarah and Lizzie alternated neatly in making the touch. After 10 minutes of pressure a quick penalty turnover was moved right and Liz was in at the corner for the history making first try for the Ladies. From the restart Irish went through a set of six touches, with good defence from Emily and Teresa to minimise the yards gained. From the turnover Chobham returned the ball with interest as Jess and Amy attacked behind the tackle to go well into the Irish half again. After defending another set of six Chobham went 2-0 up as Sabine ghosted through the Irish defence in the middle to go in from half way. Into the second period and Irish attacked with more purpose but the Chobham defence met every attack with solid defence to keep them at bay. Pressure on the tackler forced several Irish handling errors and the Ladies were able to carry to halfway, with Sabine again racing away to make 30 yards up field. The defensive pressure then caused confusion in the Irish ranks and a quick turnover set Lizzie free down the left to score the first try of the half and make it 3-0. Irish continued to go through the phases but couldn’t find any gaps in the Chobham line as Rosie and Sherrie were on hand to limit the yards gained. Into the final few minutes and a Chobham break through the middle allowed Liz Gadsby to score her second try and become the leading Chobham try scorer in her family. With Irish tiring a flood of scores, first from Brooke with neat handling down the right, then Lizzie with her second and finally Sabine both outpacing the defence made the final score 7-0 to Chobham. So a winning debut for the Ladies, built on superb defence, celebrated to the full by players and supporters alike.